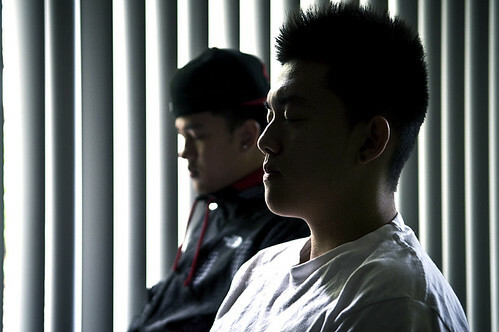 SF State students Jonathan Diep, 19 (right) and Johnathan Shay, 19 (left), relieve stress through a guided meditation workshop at the Student Health Center on Tuesday, Oct 4. Photo by Henry Nguyen. Some students can handle it, while others fall victim to it. Stress is nothing new. The never-ending mountain of homework, papers, projects and midterms combined with trying to make financial ends meet are only a few variables resulting in its total amount. Beatrice Dillon, a peer counselor with the Counseling and Psychological Services Center at SF State, said stress is based on a combination of trying to succeed in school while having time for them that puts added stress onto a student outside of work and home. What students aren’t doing is taking advantage of the their on-campus options. The Student Health Center provides students with free stress related resources, including meditation workshops, which occur monthly, as well as stress management workshops. The stress management workshops offer students to identify stress origins like anxiety, fear, procrastination and lack of organization. The Counseling and Psychological Services Center allows students up to six free counseling sessions, another student aided program that comes from semester fees. Although many students attend these workshops many do it for the extra credit incentives from their classes, according to Dillon. However, according to the spring 2011 PULSE survey conducted by SF State, only 4 percent of students said they would consult on-campus counseling if they were stressed while 85.5 percent said they would consult a friend or family member instead. Dillon said most students either don’t know these services exist or simply don’t feel the need to utilize them. It doesn’t help that in recent years stress levels have increased. According to the most recent survey on college stress from the Higher Education Research Institute at UCLA, 52 percent of students claim their emotional well-being was above average, compared to 64 percent in 1985 when the survey first began. The study, which surveyed more than 200,000 incoming freshmen of four-year universities, also claimed that much of the stress is due to maintaining scholarships and taking out loans just to pay tuition. While students juggle academics, extracurricular activities, internships and jobs, the stress continues to overwhelm many. “I have to take a break to calm down,” said Marcia Barnard, SF State psychology major. When Barnard feels the pull of stress coming on, she usually opts to distract herself by doing something she enjoys like listening to music or watching television. Barnard said doing this allows her to collect herself and feel mentally prepared to take on the task again, this time without stress. Many students like Barnard find distractions to reduce their levels. Shafeen Saheed, an SF State health education graduate student, knows about the on-campus resources, but doesn’t utilize them. Saheed represents one of the many who rely on close friends or co-workers, but at times Saheed admits that even they can be just as lost as she is. The main idea behind creating workshops and offering free services to students is so that students have options according to Dillon. “We’re not here to be their parents and say they have to use them but to educate them on what’s available to them,” Dillon said.